Wild and rugged Utah has some striking diversity in its landscapes, with the mountainous central and eastern area receiving heavy snowfalls and the western half of the state being mostly arid high desert. The Great Salt Lake dominates the northern half of the state as one of the largest inland salt water lakes in the world. 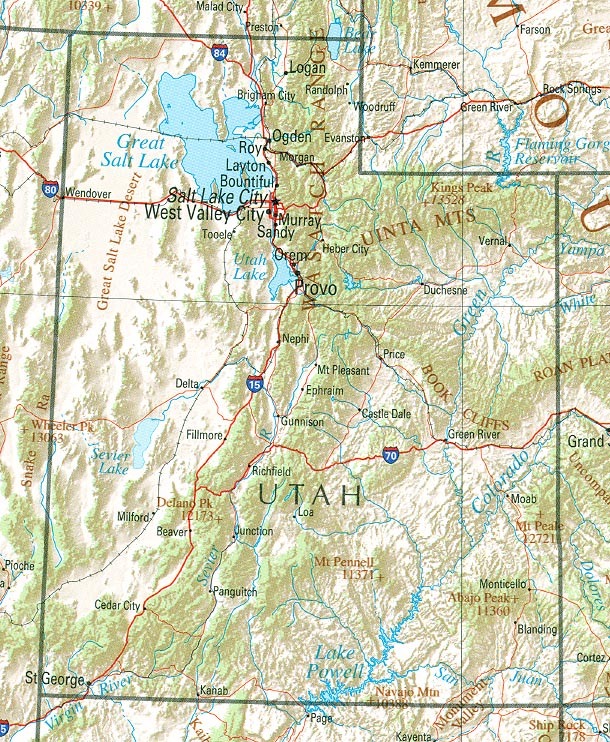 The Wasatch Range, just west of the largest concentrated population in Utah (the Salt Lake City-Provo area) is world famous for skiing and winter sports. Further to the south, much of Utah is federally protected as National Parks, the most notable being Zion, Arches and Bryce Canyon National Parks. Over 70% of Utah is federally owned and managed. Much of the state is consequently underpopulated, with the largest population of wild horses in the U.S. In the northwest of the state, the Great Salt Flats represent hundreds of miles of straight, flat landscape, which is why most of the world's land-speed records are broken here. American Indians had inhabited the region of Utah for several thousand years, and although a handful of explorers had ventured into the area, the first permanent White establishment was in the Salt Lake Valley in 1847 by Mormon settlers. 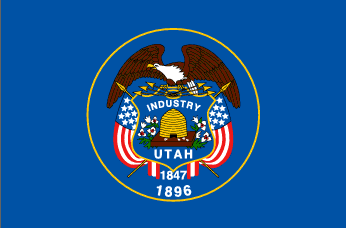 The Utah Territory was created in 1850, and after several disputes with the U.S Government (most notably the 'Utah War') largely due to the practice of polygamy in the territory, Utah was finally admitted to the Union on January 4th, 1896. Utah has the largest percentage of people claiming British and Danish ancestry. Some 60% of Utahns claim religious affiliation with the Church of Jesus Christ of Latter-day Saints, a unique and distinctively American religion (though today some six and a half million adherents live outside the U.S.) which was founded in 1820. Utah is one of the fastest growing states in the nation, in particular the Salt Lake City Area and Saint George metropolitan area in the extreme south of the state. Hispanics and Asians form rapidly growing communities in Utah. Salt Lake City, the cultural and economic center of the state, is also the most populated and the state capital. Utah has one of the highest fertility rates in the U.S., and as a consequence, one of the largest percentages of residents under 18. Utah also suffers from one of the highest teenage pregnancy rates in the nation. Much of Utah's economy is derived from tourism, with National Parks, skiing and Salt Lake City topping the list. Politically, Utah is one of the most conservative and Republican states in the U.S. In 2004, George W. Bush won every county in Utah and received his largest margin of victory, with an overwhelming 46 percentage points. 12th September 2011	 This state is such a gem of a place to live. There are fun and meaningful indoor and outdoor activities in every city and town, and the people are super cool and friendly. You can feel the economic vibrance here. 17th September 2007	 You guys better check your facts on teen pregnancy in Utah. I don't what cracker jack box you guys were doing research from. It's actually 45th fewest.